Lately I have been on the lookout for a refreshing pick me up in the afternoons when I am dragging. Don’t get me wrong I love coffee but it isn’t very refreshing. 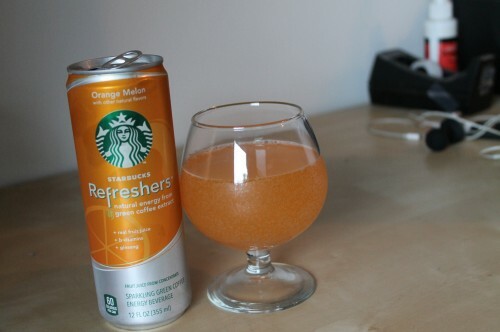 I then came across an opportunity to try Starbucks Refreshers Sparkling Beverages which sounded like it could be just what I was looking for. 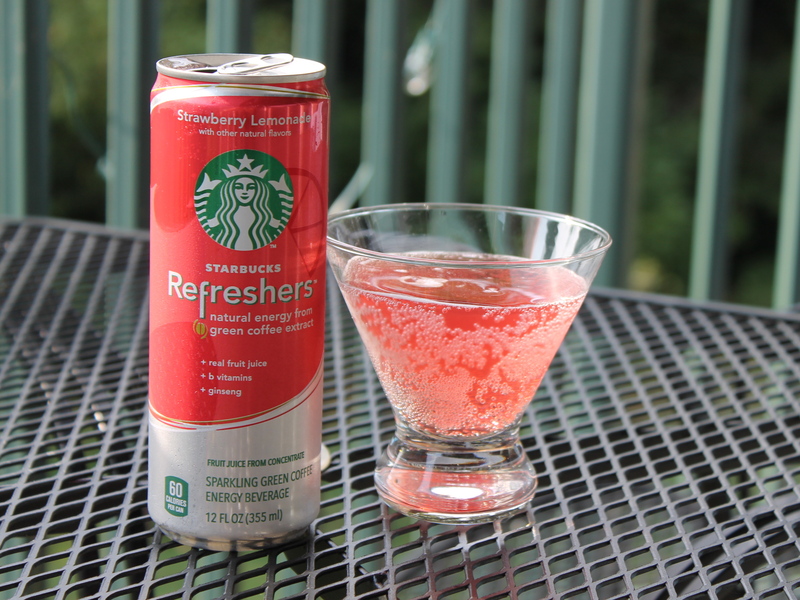 I had tried the Very Berry Hibiscus Starbucks Handcrafted Refresher at my local Starbucks a few weeks ago with my free birthday drink coupon and I really enjoyed it so I was excited to try the Starbucks Refreshers Sparkling Beverages. This was the first flavor that I tried and I really enjoyed it. It was a wonderful combination of raspberry and pomegranate, a little tangy and a little sweet. The second flavor I tried was the Strawberry Lemonade. I also enjoyed this one because if you know me you know how much I love lemonade. 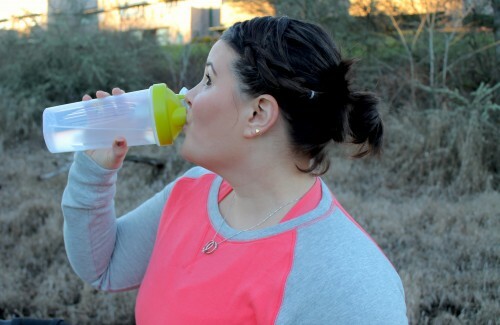 I was addicted to anything citrus, especially lemonade throughout my entire pregnancy. The last one I tried was the Orange Melon Refresher which was my favorite! I was actually surprised that I enjoyed as much as I did. I like melon but not usually in drinks and I really am not a fan of orange soda so I tried this flavor last thinking that I wouldn’t like it but I actually LOVED it. The orange and melon paired really well together without either flavor overpowering the other. Disclosure: This is a sponsored post, produced in collaboration with Bliss and Starbucks. 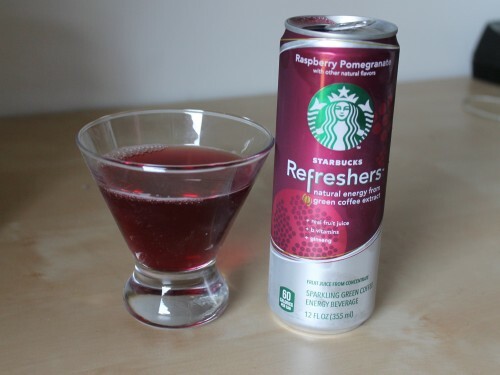 I received a Starbucks Refreshers sample to review. The opinions shared in this post are my own. Pro: I love the smell! It is really wonderful and I am looking forward to packing it up and taking it to the birthing center with us so that Neil can use it to massage my back. I also love how it sprays on so easily and isn’t too greasy feeling. Neil also loves the smell of this oil. Con: The spray is nice but sometimes it goes on a little wild- I have learned to remove my shirt before putting it on now so it won’t get all over my clothes. The other con is the price- it is a little expensive at $39. Would I recommend? I would and I AM recommending it to moms-to-be. 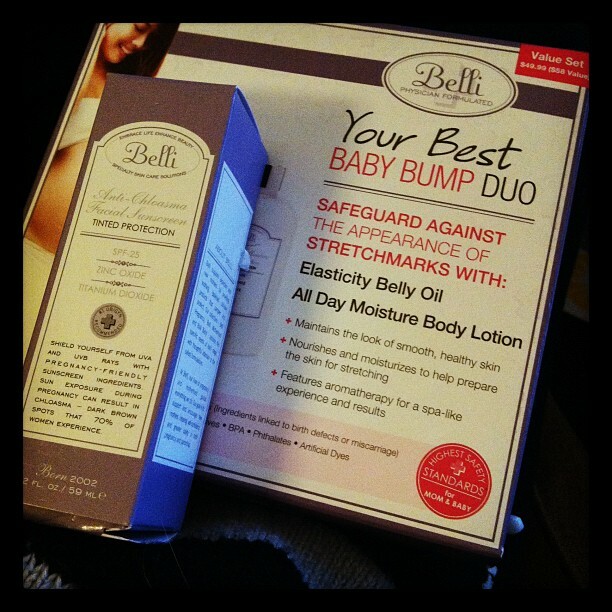 I would recommend getting the Your Best Baby Bump Duo because it is a good deal and has both the oil and the lotion. Pro: Smells like lemon cookies! I absolutely love this lotion and so does Neil. We both used it after spending too much time in the sun and it did a good job at soothing our burnt skin. It also really does a great job at moisturizing. I also love that it smells like lemon cookies but the smell isn’t over powering and really mellows out shortly after applying. Cons: I really can’t think of any cons! It is a little on the more expensive side for some but honestly I think the price is pretty competitive for the quality. Would I recommend? 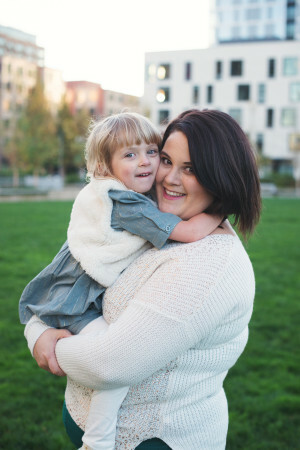 I would definitely recommended this to anyone regardless of whether you are pregnant or not. Shield yourself from UVA and UVB rays with pregnancy-friendly sunscreen ingredients. Pro: It doesn’t have the normal sunscreen smell (which I hate). Although it is tinted it blends right in and I find it evens my skin tone out just a bit (maybe I’m the only one who notices though). It isn’t heavy on the skin and it works really well with my makeup. I usually wear a tinted moisturizer and lately I have just been wearing the Belli sunscreen instead. Con: It is a little expensive, especially if you plan to reapply frequently or if you are a little heavy handed with it. I wouldn’t wear this as my go to sunscreen if I were heading to the pool or the beach but it is good for everyday wear. Would I recommend? I would recommend this, however, if you know you really need a lot of sunscreen in the summer and/or spend a lot of time lounging on the beach I would also have another facial sunscreen for that and use this as more everyday use. One lucky reader will win both the Your Best Baby Bump Duo and the Anti-Chloasma Facial Sunscreen. This giveaway is open to U.S. & Canada residents only. Giveaway is open until June 8, 2012 at 6pm EST. Mandatory: Visit the Belli Skincare site and tell me something you learned or a about a product that interest you. Disclaimer: Belli Skincare provided me with these products at no cost. I was under no obligation to review them if I so chose. Nor was I under any obligation to write a positive review or sponsor a product giveaway. Did you know? You can take advantage of savings on Belli products by clicking on the bright pink Share & Save button that appears on the far right-hand side of belliskincare.com. When they click the button and share Belli with at least 3 of their friends via email, Facebook or Twitter, they and their friends can receive an exclusive promo code good for 20% off their purchase at belliskincare.com. Spend an average of 45 minutes per day working out even on passive rest days. – Improved by 13 minutes per day (36 minutes per day) from last week but not up to where I want to be. This will continue to be a goal for next week. On passive rest days do yoga, go for a walk or do a gentle swim. –I did yoga this week! Wahoo! I did have one rest day that I didn’t do anything. Again this is a continuing goal. Get back to meal planning and work on eating foods that will benefit my health, my running and my body.- This week has been great for food! I created a meal plan this week and came home with lots of yummy nourishing food. Favorite meals of the week: Huge green salad and whole wheat penne with ratatouille sauce, and huge green salad and a quinoa bowl with tons of veggies and cheeze sauce. Hydrate. Drink more water, more frequently. That is one thing that I haven’t been doing well enough lately and I know I should.- I have been drinking a lot more water, a lot less coffee and a lot less beer. Conclusion. This week went really well. I still need to make improvements but I am on the right track. Yesterday my hips and knee were bothering me some so I decided to do hip opening yoga instead of going on my run. Today I will do that run and shift my other runs a little bit over the next week so I am gong every other day. Continue to Hydrate. Drink more water, more frequently. That is one thing that I haven’t been doing well enough lately and I know I should. Drink less coffee and less alcohol. Neil and I have decided that we are going to cut back on these two things to improve our health, our energy levels and (hopefully) our running. We have decided that we can have a coffee on Saturday and we can have a max of two alcoholic beverages per week and only on Thursday, Friday or Saturday and not before a run day. When I first started running my husband and I always went on your runs together. Although he is faster than me he was always just 2-3 minutes ahead of me and I felt safe knowing he was near by. Nowadays I often do my running alone, many times in the early morning or afternoon and since I don’t have my husband or a friend with me I always wondered what if something happened to me. A few weeks ago I made the poor decision to go out on a run even though it was hot and I knew I had not hydrated well. By the last half mile of my run I started to feel a little dizzy but I pushed through. As soon as I arrived home I had to get some water and sit down for awhile because the horrible combination of heat, humidity and lack of hydration made me feel like I was just about to pass out. I lucked out that I made it home before that feeling hit but fear set in anyways and I couldn’t stop thinking about the what ifs. That’s when I looked into getting a Road ID. I talked with the team at Road ID and they decided to send me a Road ID of my choice to have for my safety and to try out for review. I had a choice between a few different styles: the Wrist ID Sport, the Wrist ID Elite, the Wrist ID thing, the Shoe ID, the FIXX ID or the Ankle ID. I decided to go with the Wrist ID Sport because it seemed like the perfect one for running. After measuring my wrist I chose my size, color and what I wanted on my ID. I put my full name, location, my husbands number, my parents number, I noted that I have no allergies and lastly “Follow Your Bliss”. 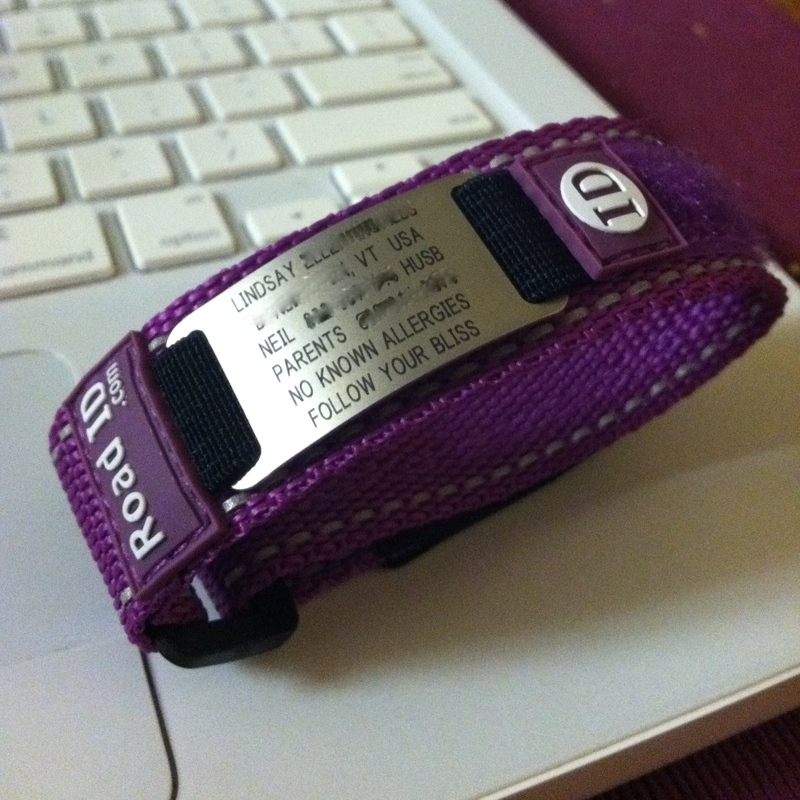 I now run with my Road ID on every outdoor run. I have a Garmin on one arm and my ID on the other and even though it looks a little silly I don’t care because it’s all about safety first. Do you run or do outdoor activities with an ID? If not when will you start to? Over a twitter discussion over my absolute favorite tea- Mighty Leaf’s Orange Dulce I came into contact with Mighty Leaf about doing a review of their new iced teas. They sent me their four new iced tea flavors to try and let me tell you they don’t disappoint. These teas are just like Mighty Leaf’s small tea bags in giant form; so not only do they make delicious tea but what isn’t fun about a giant tea bag? o Ginger Peach Iced Tea: A blissful and lightly sweet black iced tea infused with sun-swelled peaches and delicate ginger. o Calypso Mango Iced Tea: A sweet and cooling black iced tea with an indulging blend of South Indian black tea leaves, luscious mango, and tropical fruit. o Organic Black Iced Tea: A flavorful black iced tea made of refreshingly rich and smooth South Indian organic black tea leaves hand-picked on the dewy slopes of the Nilgiri Mountains. o Sunburst Green Iced Tea: A cool and vibrant iced green tea that delivers mountain-grown Chinese green tea leaves brightened with the crisp taste of ripe oranges and sweet citrus. The lowest in caffeine among all four flavors. Iced tea is my favorite summer beverage however I don’t often make it at home because unless I have loose tea it is no fun to try to make tea from a handful of tiny tea bags. Well Mighty Leaf makes things so much easier by having their giant iced tea bags. All you have to do is steep the tea bag and then add ice. It’s never been easier to make iced tea at home. I really enjoyed all of these flavors and once we started making them we haven’t been able to stop. My favorite is the Sunburst Green Iced Tea because it is fresh and crisp and perfect on a hot day. Neil’s favorite is the Organic Black Iced Tea it is wonderfully dark and refreshing. Summer might be coming to an end but it’s never too late to enjoy a nice cold crisp glass of iced tea. Mandatory: What is your favorite summer drink? Honey is one of those things I never thought much about until I went vegan and began reading labels and recipes and now I see that it is everywhere. Then came cooking where honey is often found in baked foods, desserts and granola and finding a vegan replacement can sometimes be difficult. Agave is usually a suitable replacement but the consistency is often too thin and the flavor is slightly too sweet. When I read about Bee-Free Honee I jumped at the opportunity to review and it and of course to do a giveaway. I am even more excited to do the giveaway now because I really love this product and can’t wait to have you try it as well. Although it doesn’t taste exactly like honey, it has more of an apple flavor- because well yeah it is made with apples. But it really is the closest in flavor and consistency to honey and it taste delicious. I have used it in my tea and oatmeal and on apples with cinnamon and almond butter. I haven’t tried it in baked goods or granola yet but that will be my next challenge. Now that you know more about this wonderful product I am going to give two lucky people to win a bottle of their own. All you have to do is enter- oh and for an additional chance to win head over to Keri’s blog I Eat Tree’s because she is also giving away a bottle. To Enter: (leave a comment for each entry) The giveaway is open to U.S. residence only. The winner will be randomly selected on Monday, March 21th, 2011 at 11 PM EST. Follow me on Twitter and leave a comment below telling me you did. Tweet, “Enter to win #vegan Bee-Free Honee @cookveganlover http://wp.me/pFVWo-1H2” and leave a comment to tell me you tweeted. “Like” Cook.Vegan.Lover on Facebook and leave a comment below telling me you did.